The arrival of summer means it is time to put on those swimsuits and head to the pool! A splash in the pool is perfect for cooling you down on a hot day, plus it is also great exercise and a way to make some memories, but did you know that every summer, hundreds of children are hurt or killed in pool accidents? No one wants to end up with an injured child on a day that was meant to be full of fun. Playing it safe around swimming pools is always smart, and can ensure that you and your family enjoy the pool year after year with hopefully no accidents plaguing your summer, however, if you and your family do find yourselves in such a situation, it is important to know that there is help out there for you if you need it, whether it is from other family members, from friends who might be able to help you with emotional support, or a lawyer who might be able to help you with compensation should you wish to. So how can you be sure you are playing it safe? Take a look below at 7 swimming pool safety tips that you need to know, so you can keep your family safe while still having fun. 1. Pools should always be fence protected. In most home insurance plans, it dictates that pools must have fencing around them. Even if yours doesn’t dictate this, it is a wise investment and could save a life. If visiting a friend’s where there isn’t fencing, never allow children to be outside unsupervised as one slip or mishap could result in serious consequences. 2. Invest in safety alarms. Even with fencing, safety alarms are a great idea. You can put quick acting, high pitch alarms on pool gates or even back sliding doors so you know if a child has headed towards the pool. These don’t have to be expensive and while noisy, they can quickly alert you if a dangerous situation is possible. 3. Remember that floaties aren’t life saving devices. Even if your child has a raft or water wings, do not rely on these items for life saving devices. They are tools to help your child in the water, but do not take the place of an adult watching while children are playing in the pool, as floaties can easily slip off. Instead, always be present in the water with children who can’t touch the bottom of the pool. 4. Make sure rescue equipment is always near. Whenever using a pool make sure there is a phone near should someone need to dial 911. You also want to make sure a shepherd’s hook is near in case you need to quickly pull someone from the water. A life bouy is also advised, as are instructions for CPR in case no one on hand is familiar with this life saving practice. 5. Know what the signs of drowning look like. Many people thing that drowning involves lots of splashing and screaming, but this is rarely the case. When someone drowns or begins to drown they often slowly sink before disappearing beneath the water. It is wise to always do a head count when swimming with a group every few minutes. Avoid playing games where people go under water and hold their breath for a certain amount of time, and encourage as much above water play as possible. If you, or someone close to you, is involved in a swimming pool accident in a public pool then you may have grounds for a premises liability case – you should seek legal representation at your earliest convenience. When swimming with children it is important to take frequent breaks. They can quickly tire out and this can affect their strength to swim. Have children take breaks every 30 minutes where they can hydrate, get more sunscreen on, or just relax. Frequent breaks also give you a chance to relax so you can be at your best when it comes time to watch over them again. 7. Enforce a no running/jumping/diving rule. So many children are hurt each year due to running, jumping, or diving in and around pools. Enforce a no diving rule since it can cause neck injury. Jumping and running around the pool should also be forbidden and all horseplay should be as well. It is instances such as these that can result in the worst injuries, so be firm and don’t allow it with your own children or others around the pool. Remember that even children in their teens should be supervised when swimming, and that while you may feel like a spoil sport, it is your job to keep them safe. It is also good to go over basic water safety and rules for the pool with children before getting to the pool. 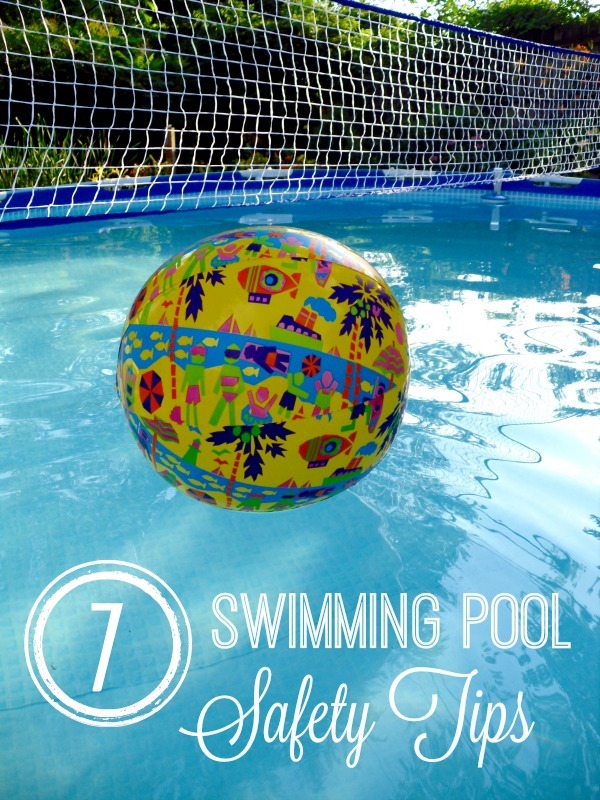 Give these 7 pool safety tips your consideration and enjoy a happy, injury free summer. Fisher-Price Roller Blocks Whirlin’ Train Town only $4!! 10-Hour Nursery Ultrasonic Cool Mist Humidifier $19.99 (reg. $39.99)!